John DeLuca and Evan Wagner, students at H.B. 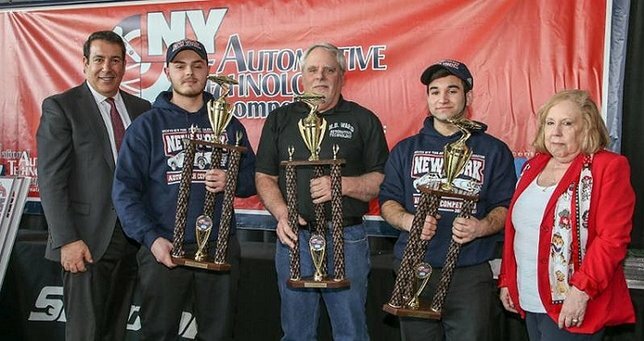 Ward Technical Center in Riverhead, New York, competed against 12 teams from downstate New York to win the New York Finals of the Automotive Technology Competition. H.B Ward Technical Center instructor Michael O'Hara (center) with winners Evan Wagner and John DeLuca receive trophies from GNYADA board member John LaSorsa and GNYADA Auto Tech Competition coordinator Carole Rogner. Riverhead, NY - February 15, 2017 - John DeLuca and Evan Wagner, students at H.B. Ward Technical Center in Riverhead, New York, competed against twelve teams from downstate New York to win the New York Finals of the Automotive Technology Competition. The State Finals took place at the Center for Automotive Education & Training, 15-30 Petracca Place in Whitestone, Queens, NY. The students will go to the National Finals in April and represent greater New York at the National Automotive Technology Competition and a chance to become America's Next Top Auto Technician and a share of more than $3 million in scholarships and prizes.The event is supported in full by the Greater New York Automobile Dealers Association. The student's instructor is Michael O'Hara. The Automotive Technology Competition is a test of skill, a measure of knowledge, and a race against the clock-all rolled into one. It features the best high school automotive education students competing for prizes, scholarships, and the chance to represent the Greater New York area in the 2017 National Automotive Technology Competition. Prizes and scholarships are awarded to participating students and schools. Prizes and scholarships awarded to participating students and schools are thanks to the generous support of local dealerships, almost every major automaker, industry suppliers, and automotive education programs. Headquartered in Whitestone, Queens, the Greater New York Automobile Dealers Association (GNYADA) represents over 400 franchised automobile dealerships in the metro area of New York, selling more than 550,000 new and used cars each year. Collectively, they inject $39.6 billion into the economy while helping to sustain a workforce of over 65,000. GNYADA also owns and operates the Center for Automotive Education & Training, and the New York International Automobile Show. The Association opened its doors in 1910 and has continued to serve the needs of the industry ever since. Subject: LongIsland.com - Your Name sent you Article details of "Long Island Students Take 1st Place in NYS Finals of Automobile Technology Competition"